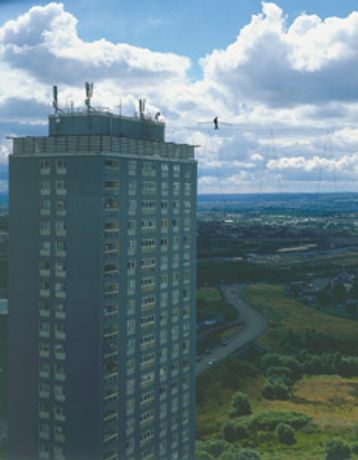 A multi-screen video installation receiving its première at the CCA for Glasgow international Festival of Contemporary Visual Art 2008 High Wire continues Catherine Yass' interest in vertiginous spaces: architecture, height and scale have been dominant formal themes in her previous work. 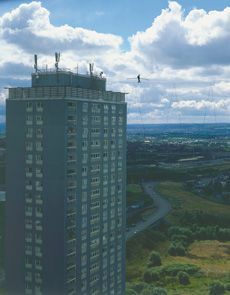 High Wire draws on Yass' filmed footage of acclaimed high wire walker Didier Pasquette at Red Road in Glasgow in 2007, and is as much concerned with the isolated physical space inhabited by the walker â in a landscape dominated by the brutalism of the tower blocks â as with the remarkable mental and physical transformation during the course of the attempted walk. The exhibition also includes a new series of Yass' lightboxes evolved from the project at Red Roads.